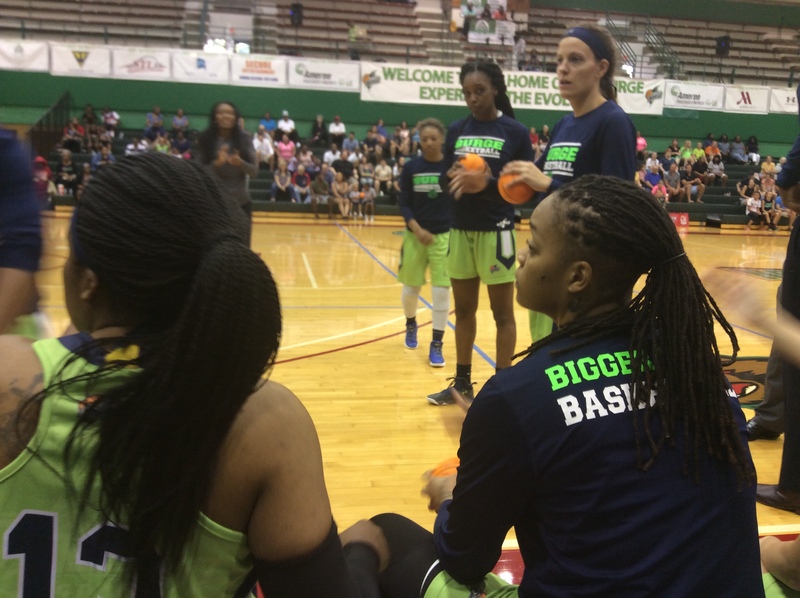 (ST. LOUIS, MO) Heading into the backstretch of their regular season, the St. Louis Surge women’s professional basketball franchise kept their home record unblemished with Saturday night’s 87-74 win over the Georgia Stampede at Washington University’s Field House in front of 500 spectators. 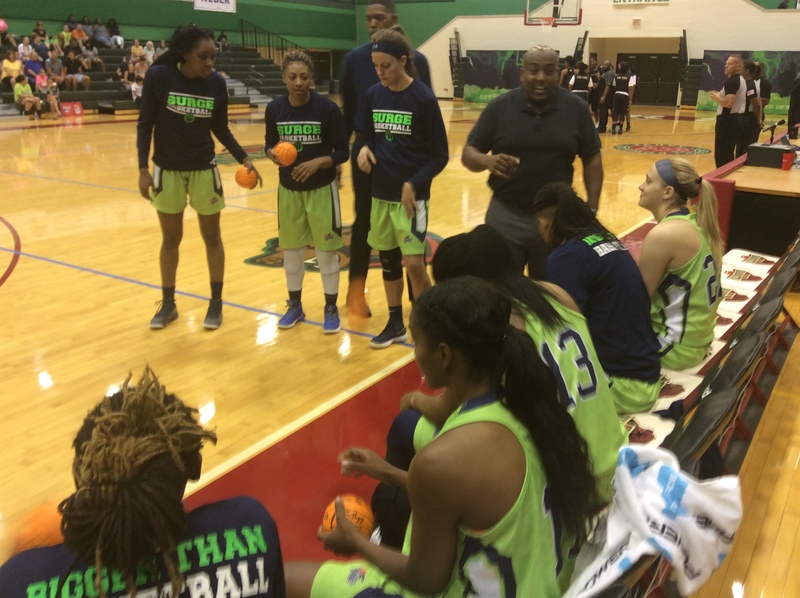 The baker’s dozen triumph pushed the Surge’s record to 7-2 and provided the hoop hustle that they needed with the potential of post-season placement within ,Women’s Blue Chip Basketball League (WBCBL) on the horizon. The Surge’s task to collect a fourth straight home win was not easy as the Stampede (3-6) challenged the locals from the get-go and mightily marched midway through the third quarter to tie the score. Trailing 3-2 within the first minute, the Surge claimed a trio of treys and built a sizable advantage. Jaleesa Butler’s three-pointer the 8:35 mark flipped the scoreboard, 5-3. Brittany Carter followed with the same result one minute later and Butler’s second of the frame with seven minutes left gave St. Louis an 11-5 edge. Meanwhile, the Stampede gave chase with Lynette Holmes’ pair of buckets that narrowed the score to 11-9. After both teams traded points, St. Louis’ Jordan Jones notched back-to-back two-pointers that widened the score to 18-11 with 4:30 left. The Surge maintained the seven point differential with Butler’s five-foot jumper with 3:30 left that made the score 22-15. Paced by Butler’s eight points in the stanza, the Surge held a 24-19 edge at first quarter’s conclusion. In the second quarter, St. Louis utilized a 7-0 sprint midway through the frame and expanded their lead. Launched by Leti Lerma’s lay-up and finished by Carter’s finger-roll with 5:10 left, the Surge pushed the score to 31-22. Georgia countered with a 9-2 run over the next two minutes via Holmes’ hot shooting from the floor. This resulted in the Stampede slicing the Surge’s lead to 33-31 with 2:30 left in the half. Both teams traded points over the next minute and then the Surge claimed back-to-back buckets from Jordan Jones and Kristi Bellock that widened the Surge’s lead to 41-35 with thirty seconds left. With their 18-17 edge in scoring over the Stampede in the second, St. Louis possessed a 41-37 advantage at intermission. Georgia made their strongest push with a 12-8 start in the opening minutes of the third. With four three-pointers collected, including Holmes’ crowd-killer with four minutes remaining in the frame, the Stampede tied the score 49-49. Facing adversity, the Surge countered with a 8-1 run over the next two minutes. Launched by Butler’s ten-footer, accented by Sherise Williams’ three-footer thirty seconds later and finished by a pair of buckets from Mariah King, St. Louis built their lead back up to 57-50 with 1:50 left. Even with their mini-burst at the end, the Surge barely edged the Stampede in third quarter scoring (22-20) and clung onto a 63-57 lead heading into the final frame. It was at that time that Harris, a long-tenured Surge veteran, was ready to sharpen her proverbial claws alongside her sistren. Leave it to Harris to command the corral of the unbridled stampede. Her pair of quarter-opening treys set the tone. 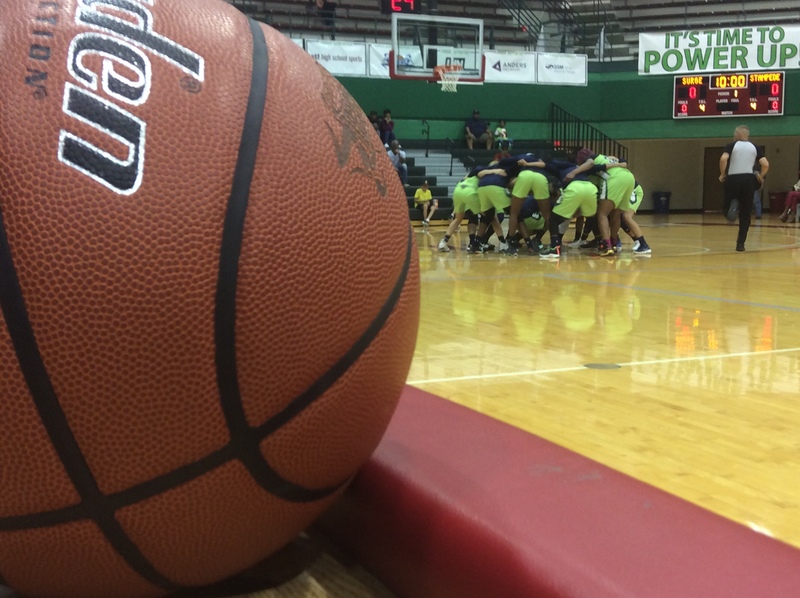 When the second hit at the eight-minute mark, the Surge held their first double-digit lead of the evening, 69-57. Then after converting on a pair of free throws a minute later and hitting a two-foot jumper with 6:05 remaining, Harris’ individual 10-point push resulted in the Surge’s 73-62 lead. The Stampede attempted a comeback but St. Louis’ 8-0 run down the stretch secured victory. Lerma collected a pair of glass kissers while Kelsey McClure snared a lay-up as St. Louis’ lead blossomed to 85-70 with two minutes left. The Surge outscored Georgia, 24-16, in the final quarter en route to the 87-73 victory and maintained a spotless record at Wash U (4-0) on the year. Five St. Louis players scored double-digits on the evening, paced by Harris’ 22 points while Holmes topped Georgia scoring with 39 points. St. Louis finishes their regular season next Sunday afternoon in a 2 p.m. home meeting with WBCBL Atlantic rep Music City Icons (1-5). The Surge topped the Nashville-based team earlier this season, 93-70, but Harris is fully aware that the visitors are ready to play at their best just like the Stampede did on Saturday. “I expect it to be a battle but I also expect us to fine tune everything and for us to look good,” she said. 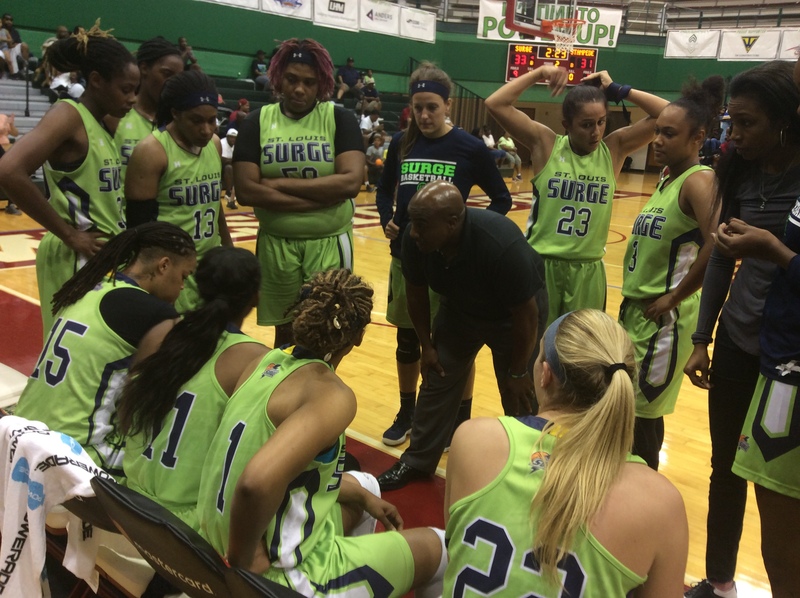 For more information on Surge Basketball, go to their official website. SURGE INDIVIDUAL SCORING (87): Harris 22, King 14, Carter 11, Bellock 10, Butler 10, Lerma 8, Jones 6, Latham 2, McClure 2, Williams 2.